A minor injury or illness that leaves you temporarily disabled may not seem like a big deal, but it can be; especially if you are forced to miss work. A lot of people assume they are covered by their health insurance, worker’s compensation, or workplace disability insurance, but they aren’t. That’s why you should strongly consider purchasing disability insurance. Around 50 percent of American workers have disability coverage included in their employee benefits. However, the other half must purchase coverage individually or through a voluntary benefits plan in the workplace. Regular health insurance may cover your medical bills, but Social Security disability benefits are only for long-term incapacities. Additionally, workers’ compensation will only help if you were injured or became ill at work. It’s estimated that around six percent of American workers experience short-term disabilities which can include injuries, illnesses, and pregnancies. According to a report published by Bankrate last year, more than 60 percent of Americans can’t even afford an unexpected bill of $500, which means that without a job, few people would likely be able to afford the basic costs of living. Disability insurance can help protect you financially if you miss work due to ill health or injury. A short-term disability insurance plan will protect workers’ incomes if they miss work between three days and six months as a result of a disability. Long-term disability insurance plans will cover periods of time between 2-10 years (or until retirement age). Most short-term disability insurance plans will cover around 60% to 70% of your income, while long-term plans cover 40-70 percent. However, you should be aware that most plans have waiting periods, which means that a certain time could lapse before you are paid. Disability insurance can help protect you financially in case you’re forced to miss work for an extended time due to illness, injury or pregnancy. 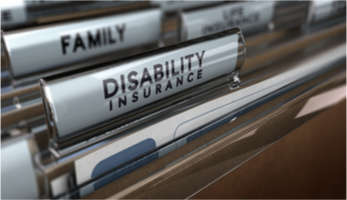 For help finding the right disability insurance plan, be sure to visit us at The Benefits Store today.